Received my jeans! I absolutely adore them! They are so comfortable and are true to size! This is truly a great product and I am so thankful that you created them! Very stylish I got compliments on them already!! Thank you! I ordered the jeans for my sister, Kirsten. She has never been able to wear jeans before, so she is super happy. Her favorite features are the pockets on the thighs and the opening for her catheter. I’m glad for the extra length so we can hem them to fit her perfectly. These jeans are perfect for my son. No pockets in the back to create skin issues; easy to get on and off with the elastic waist and loops for pulling; no pinching in the tummy area due to the cut. Nice and roomy where needed, and stylish! I have been looking for these jeans for years! It is very important to me for him to have clothes like other “typical” people his age and not have to wear workout pants every day. Thank you so much for making these jeans!!!!! Thank you for designing your wheelchair jeans. I love my pair, especially the very large reachable Pockets. I’m happy that you think the belt loops are a great idea! Please let me know when your next design is available so that I can order another pair of your wonderful jeans. Best jeans I own now since being in a wheelchair. The back is raised up so you don’t have to hike your pants up. Big pockets placed on top of your quads instead of on the sides. Flexible material but still looks like jeans. Super Comfortable. With more than 20 years wearing high-end jeans from Lucky, Guess, Tommy, Nautica, and Banana Republic, I finally switched to Alter Ur Ego. I was looking for something that was not just fashionable, but functional as a paraplegic. With Alter Ur Ego, you get just that, fashion and function. With no back pockets the worry of pressure sores are a thing of the past. The large pockets on the thigh make them great for carrying your wallet, cell phone or just about anything else you can think to put in there. Now, the high-end jeans are a thing of the past; I wish I would have made the switch long before! I wear jeans every day. When I first met her, my wife used to wear jeans every day too. She continued to wear jeans every day until her brain hemorrhage five years ago, after which jeans became impractical. Today she wore jeans again for the first time. This means a lot to us. Thank you! 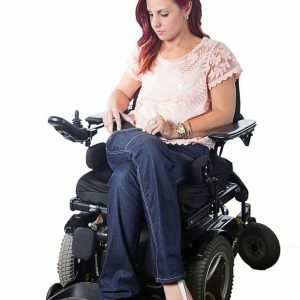 I never knew I needed jeans that were specifically designed for wheelchair users until I tried a pair of ALTER UR EGO jeans. They are the best fitting jeans. Alter Ur Ego’s adaptive jeans are amazing! Before Alter Ur Ego’s jeans, I had only worn jeans that are not adapted for people with disabilities. I appreciate the various features of the pants such as the higher back to cover my bottom when I am sitting down. 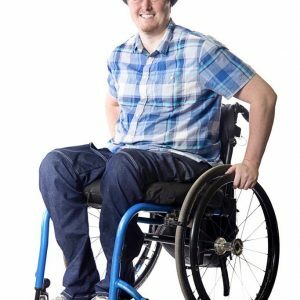 I would absolutely recommend these pants to other people with disabilities.